How do I get to Darby Creek Golf Course? Columbus, 270 Outer Belt - Route 33 west to Plain City/SR 161 exit. Take a left on SR 161 and go west to Plain City. Outside of Plain City go right on to Middleburg-Plain City Road. Follow this road for 5 miles to the first stop sign (Watch your speed going through Unionville Center). This will be SR 38. Go right on SR 38 for 1 mile to Fairbanks High School. Take a left on to Orchard Road at the high school. The golf course is 1/4 mile on the right. Cincinnati, Dayton, Springfield - Take SR 68 North through Springfield. Just outside of Springfield take SR 334 to SR 4. Go left on SR 4 to Milford Center. 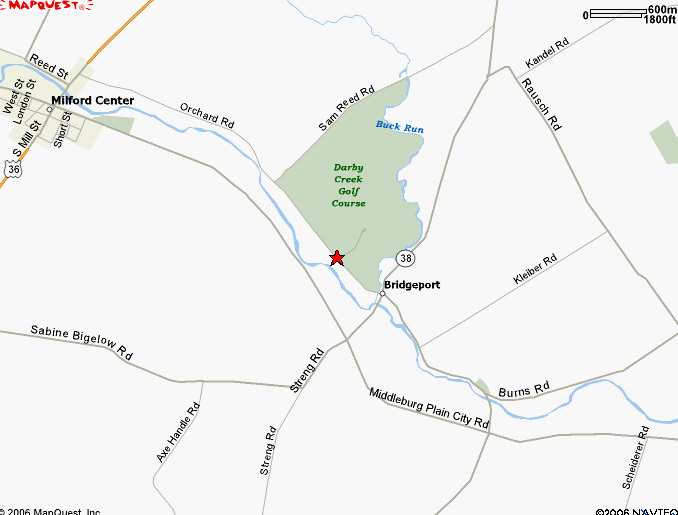 Just as you are leaving Milford Center you will come to Orchard Road on the right hand side. Turn right and the golf course is approximately 2 miles down the road on the left. Lima,Wapakoneta, Bellefontaine - Take SR 33 toward Marysville. Outside Marysville, take SR 36 & SR 4 toward Springfield. As you enter Milford Center, Orchard Road will be on the left. Turn left and the golf course is approximately 2 miles down the road on the left. Piqua, Urbana - Take SR 36 East to SR 4. Go North (left) on to SR 4 to Milford Center. As you are leaving Milford Center, Orchard Road will be on the right. Turn right and the golf course is approximately 2 miles down the road on the left. SR 23 Marion Area - Take SR 4 Marion south to Marysville. Take SR 33 west around Marysville to SR 4 again. Take SR 4 SW toward Springfield. 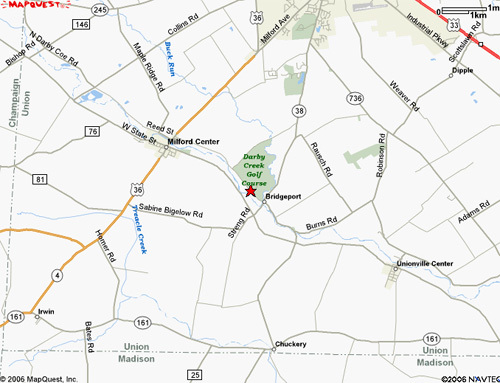 As you are entering Milford Center, Orchard Road will be on your left hand side. Take a left and the golf course is approximately 2 miles down the road on the left hand side. SR 23 Delaware Area - Take SR 36 West to Marysville. Catch SR 38 in downtown Marysville and go south (left). Take SR 38 past 2 other golf courses to Fairbanks High School. Turn right on to Orchard Road at the high school. The golf course is 1/4 mile on the right.